Why do you play the pokies? To win big, right? But not every online pokie out there genuinely offers you the chance to win big. And how big is winning it big, anyway? A couple of grand? Winning two million dollars is no easy feat these days, but there is one way to give yourself a chance to win a couple of million: you can play the Hall of Gods online progressive jackpot pokie. Online gaming production giant Net Entertainment has gone all out with its progressive jackpot pokie, Hall of Gods: one of the bigger progressive jackpots on the Internet at the moment. 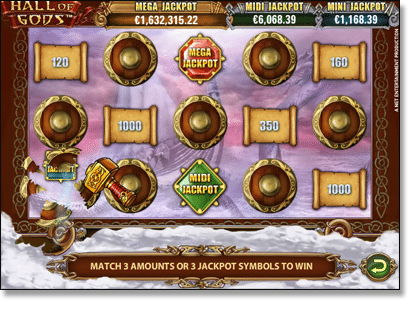 A five reel and fixed 20 payline pokie based around the Nordic Gods of Asgard, it boasts three progressive jackpot levels: the Mega (around two million dollars), the Midi (around $8,000 AUD) and the Mini (around $1,000 AUD). Note: jackpot totals are relevant at the time of writing and are constantly fluctuating. Hall of Gods is available to play through the trusted and safe online casinos recommended in our casino table above. Each of these casinos offers an enticing sign up deposit incentive, with a selection of progressive jackpot pokies available to play for real money. Depositing and withdrawing funds through the above casino sites is a simple and safe process. Each accepts Visa and MasterCard, Paysafecard, Neteller, Skrill and other secure Australian-friendly methods. Check each site for deposit minimums and maximums and to see which pay methods are instant or have a slight delay. Hall of Gods can be played for free or real Australian currency, so you can play for fun to get a feel for the game before deciding to play for real money and possibly win yourself a small fortune. Note: the jackpots can’t be won during free play mode. Hall of Gods is bursting at the seems with features, including the bonus feature to activate the jackpots, free spins and expanding wilds. Three Hammer Bonus symbols anywhere on reels three, four and five gives you the chance to win one of the progressive jackpots. Once triggered, you are taken to a screen covered with 15 shields and your mouse cursor is now Thor’s hammer. You keep clicking on shields to reveal either a Mega, Midi or Mini bonus symbol or a credit amount. When you have revealed three of the same jackpot symbols or credit amounts, that is what you have won from the bonus round. Your chance of striking it big with one of the progressive jackpot symbols is increased by the bigger your bet is per spin. The free spins mode is triggered by any three, four or five scatter crow symbols appearing during regular play. 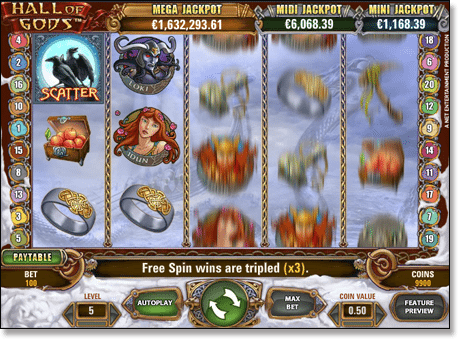 The free spins are played at the same bet level and coin value as during regular play, and during the free games, all wins are multiplied by three, except the Hammer Bonus during your free spins (which can still activate the bonus round during the free spins feature). The free spins feature can also be re-triggered, and all wild symbols (detailed below) are still available and still expand during free spins mode. Hall of Gods also offers an expanding sea monster wild symbol. The wild symbol only appears on reels two, three and four and expands to cover the entire reel it is situated on for any winning payline combinations. Hall of Gods can be played for free through our featured sites or for a minimum of AUD $0.20 per spin or a maximum of AUD $50.00 per spin. Odin the ruler of Asgard and one Hall therein; Valhalla. Thor is the God of thunder and son of Odin. Freya is the Goddess of Love and Sexuality, and oversees the other Hall of Asgard, Folkvangr. Loki is a shape-shifting agent of chaos who manages to cause constant trouble. Idun is the Goddess of Apples and Youth and was once duped by Loki and subsequently kidnapped by a rival God. Then there is a ring, Thor’s hammer, a necklace on a stone, a tomahawk and a bushel of apples. Head to GdayCasino.com, register an account and start playing Hall of Gods for your chance to win in excess of $2,000,000. Even if you don’t manage to win the Mega, Midi or Mini jackpots, there are still lots of chances to win through the Hammer Bonus, the free spins feature and expanding wilds. Good luck.